Some Idaho lawmakers who were worried that special recognition of the Idaho giant salamander could lead to federal protections have rejected a grade school student's request that it be named the state amphibian. 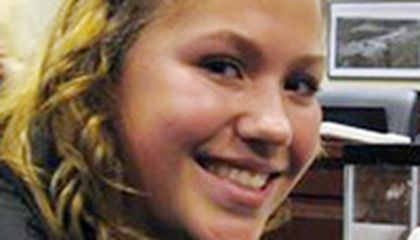 The House State Affairs Committee voted against 14-year-old Ilah Hickman's plan. It was her fifth attempt in as many years to persuade lawmakers that the salamander made a good choice for state amphibian. "I was kind of disappointed, but either way I'm going to come back next year and push it again," Hickman told The Spokesman-Review. "I'm going to keep pushing, until it either passes or I can't get hearings anymore." An Idaho attorney general's opinion advised lawmakers that approving the salamander as a state symbol wouldn't do anything in the way of encouraging federal protections, but lawmakers remained wary. Sen. Janie Ward-Engelking, D-Boise, pointed out that designating a state symbol had nothing to do with endangered species. "We addressed that," Ward-Engelking said. "We got an opinion from the attorney general - it was very clear. I spoke with him personally. He said no way, no how was a state symbol going to impact that whatsoever." Frank Lundberg, a herpetologist, testified in support of the bill and was disappointed after it failed. Idaho fourth-grade classes study state symbols as part of Idaho history, and a fourth-grade teacher backed the bill as well. But Rep. Ken Andrus, R-Lava Hot Springs, voted against the salamander after recalling being repulsed by them as a young boy. "They were ugly, they were slimy, and they were creepy," he said. "And I've not gotten over that. So to elevate them to the status of being the state amphibian, I'm not there yet." The Idaho giant salamander can grow to more than a foot long. Hickman told lawmakers that the salamander makes its home almost exclusively in Idaho, and noted it has skin markings that resemble a topographical map of Idaho's Bitterroot Mountains. Critical thinking challenge: Why is the giant salamander referred to in this story called the "Idaho" giant salamader? Okay then, this was kind of odd... I just don't really get how this is such a big deal, and why the girl is pushing so hard for her salamander to be the state symbol. Anyway, to answer the question, it is called the "Idaho" salamander because it is almost exclusively in Idaho, and its patterns on its skin resemble a topographical map of Idaho's Bitterroot Mountains. According to the text, Idaho State Representatives wont allow the Idaho Giant Salamander to be the state amphibian. A middle school student wants it yo be the state amphibian because she believes they are in danger. She also believes that if they become the state amphibian that people will care for them more and not want to harm them. The state officials say that she has sent in a letter every ever trying to persuade them to make the Idaho Giant Salamander the state amphibian. She states that she won't stop either. I think this is cool because she is following what she believes in. 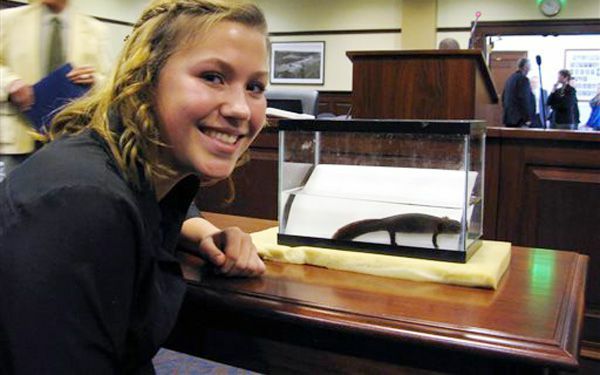 This young girl in Idaho studied the salamander and tried to spread awareness about this mammal to save its habitat and takes a strong stand against congress. I love this girl's enthusiasm! I am a firm believer in standing up for what you believe in. If this girl believes in making a giant salamander her state amphibian, then I'll stand by her! Having a giant salamander as the Idaho state amphibian would be really unique and would increase Idaho's tourism. I hope that this gets passed real soon, because I would love to see it! I believe that this girl is on the right path but just needs a different approach. I think she should show the lawmakers why she wants to make the lizard the state amphibian. If she does that then she is definitely. The substitute teacher told me to take a look at giant salamanders in Japan, so basically he was saying that this salamander does not deserve this much of a recognition. This article was about a fourteen year old girl named Ilah Hickman. She has been pushing to make the Idaho giant Salamander the state amphibian for the past five years. Her most recent attempt to convince the House State Affairs Committee that the giant salamander would be good failed but she said that she is going to keep trying until they wont allow her anymore hearings. Although I think that his is a little bit of an odd thing to be passionate about I think that its cool she's trying so hard. I think that the salamander should definitely be the state amphibian. It is basically only native to Idaho which makes it unique to the state. Also, the markings on it look like the topographic map from one of Idaho's mountain ranges. If that doesn't make it special to the state, nothing will. I think that having it as the state symbol would be unique and special. this entry was interesting. the reasons for the salamander to be the state animal is in good standings but the senator is just rejecting it because it was repulsive to him as a child. I hope Hickman gets his wish fot the salamander to be the Idaho state animal.